our 135-year heritage in downtown Statesboro, and it’s our hope you sense a welcoming and friendly spirit when you enter our church. We want you and your family to feel right at home. 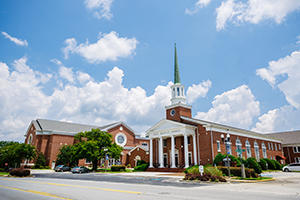 First Baptist Church Statesboro is located at 108 N. Main Street. We take up the city block, so be sure to check out the map below for the most convenient parking. Golf cart shuttles are provided for your convenience. We know you have many options on a Sunday morning in Bulloch County, and we are happy you’ve decided to join us. There’s a place for you at FBC.